**** Chosen by Winner: Jon U. This one-off customized KA-BAR Limited Edition E.W. Stone knife features 29 gemstones (emeralds, amethyst, rubies and garnets) inset into the skull pommel of the handle, along with a polished brass tooth. KA-BAR and E.W. Stone, Jr., E.W. Stone's son, have collaborated to release 350 of the iconic, theater-made World War II knives. 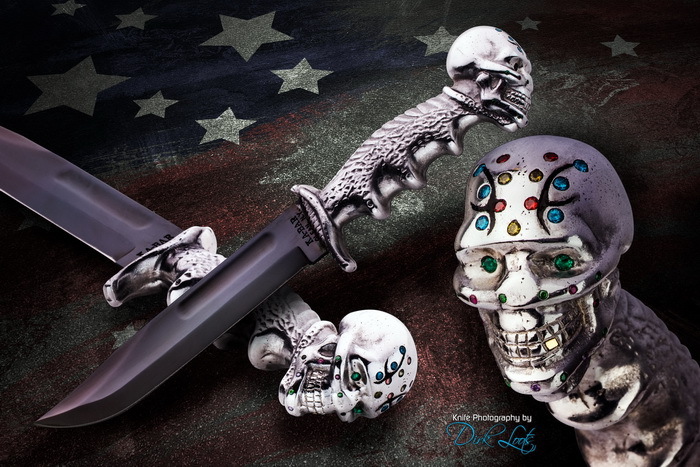 Using the original casts, the legendary skull and cobra handle grips a blued KA-BAR USMC Fighting/Utility knife. The climate and the nature of combat in the South Pacific lead to the creation of the Stone Knife. The leather handle of the KA-BAR USMC Fighting/Utility knife often fell prey to the humidity, rainfall, and combat conditions of the Pacific campaign. Though the blade remained intact, the handles occasionally suffered from jungle rot. In a display of resourcefulness, E.W. Stone, Sr., who worked in the foundry of the USS Holland, cast new handles onto the KA-BAR blades. Stone salvaged material from downed Japanese aircraft to make his signature handle. Approximately 250-300 E.W. Stone theater knives were made during World War II. Those that remain are some of the most prized and valuable of WWII collectables. KA-BAR E.W. Stone Knife Limited Edition from KA-BAR Knives on Vimeo. Each knife handle was personally finished by E.W. Stone, Jr. (check out the video above) and includes a certificate of authenticity signed by KA-BAR President John Stitt and E.W. Stone, Jr. The modern KA-BAR E.W. 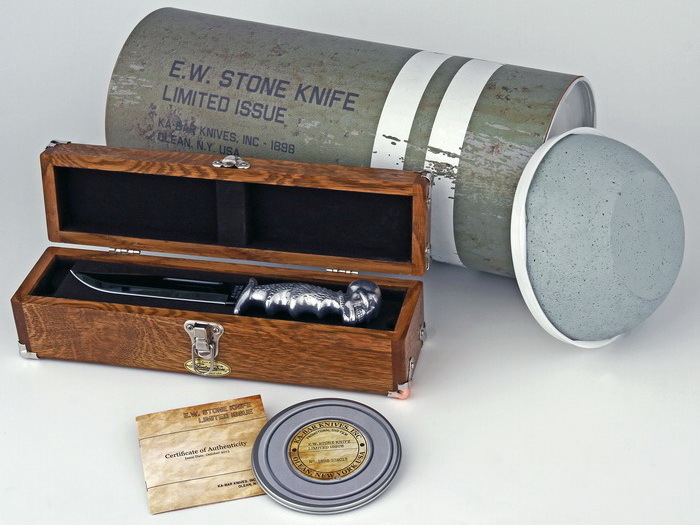 Stone Knife features a JRE semi-custom leather sheath, a golden oak Gerstner display case, an informational booklet and DVD, all packed in a simulated WWII Mortor shell tube.